When you take on the responsibility of being a family caregiver to an elderly person with Alzheimer’s disease, one of the things you might worry about most is how to keep them safe. People with Alzheimer’s disease often do things that don’t make sense to others. They might put things in their mouths or use appliances in strange and unsafe ways. When you’re trying to make the older adult’s home safe, it can be easy to overlook certain household items that might be dangerous. Here are 5 things you may need to hide or remove from the home. Colorful detergent pods may look like candy to a senior with Alzheimer’s disease. As a result, they may put the pods into their mouth. Detergent pods are highly toxic and can lead to death. In fact, statistics show that seniors with dementia are more likely to die from ingesting a detergent pod than children are. 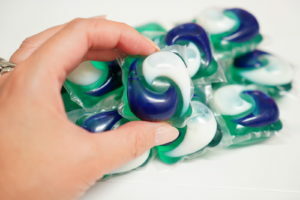 To prevent the problem, you can either switch from pods to another form of detergent or place the pods in a locked cabinet. Some Alzheimer’s patients may become confused and wander away from home. To prevent them from leaving the house unattended and becoming lost, keep doors and windows locked. It may also help to place locks near the tops of doors where they are out of the senior’s line of vision. Seniors with dementia may accidentally drink household cleaners, which can be poisonous. Unfortunately, the bodies of older adults aren’t as capable of removing toxins as the bodies of younger people are. As with laundry detergent, all household cleaners should be kept in places where they are not accessible to the senior. Locks on inside doors, like bathrooms and bedrooms, can be a problem for people with Alzheimer’s. They may go into the bathroom and lock the door out of habit but be unable to get it unlocked when they are finished. To prevent your aging relative from locking themselves in a room, remove the locks from all inside doors. People with dementia may be confused by decorations that resemble foods, like plastic fruit in a bowl or a magnet that looks like food. This could cause them to put the item in their mouth, causing choking or swallowing an inedible item. To keep your loved one safe, remove all such items from the home. Home care can assist with keeping your aging relative safe when you can’t be there. Home care providers can supervise the older adult to ensure they don’t get into something they shouldn’t. Home care providers can also prevent seniors with Alzheimer’s from wandering and getting lost.